In northern Arizona lies one of the Seven Wonders of the World, the Grand Canyon. The Grand Canyon is a massive canyon of red rock. At the bottom of the canyon runs the Colorado River. The Grand Canyon is over 277 miles long and over 1 mile deep. It is up to 18 miles wide and getting wider. 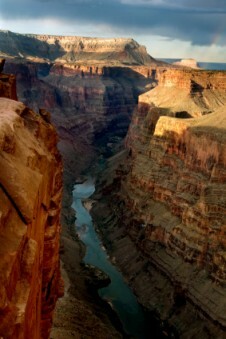 The Grand Canyon was made by the Colorado River. The river has run through this area for almost 2 billion years, carving the rock into a canyon. Native Americans have lived around the Grand Canyon for thousands of years. Today, almost 5 million visitors come every year to marvel at the canyon. People like to go hiking and rafting in the canyon. Hiking the Grand Canyon is thrilling, but dangerous. You can also camp in the Grand Canyon. People coming to the Grand Canyon should be careful though. Hiking here is very hard and people often must be rescued because they become too tired or dehydrated to continue. Over 600 people have died in the Grand Canyon in the last 150 years. 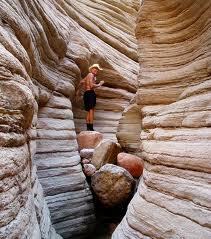 People enjoy hiking, camping and rafting in the Grand Canyon. The ancient Pueblo Indians first inhabited the Grand Canyon over 3,000 years ago. They used the caves for shelter and stored grain in rooms cut out of the rocks. The Grand Canyon was a sacred site to the pueblo people. They made pilgrimages to it. People take helicopter rides into the canyon. The canyon is 4 miles across at the narrowest point. President Theodore Roosevelt often visited the canyon to tour and hunt. He guided the decision to make the canyon a national park. John Wesley Powell, for whom Lake Powell is named, was the first to lead an expedition into the Grand Canyon in 1869. He gave the canyon its name. The weather here is extreme. In the summer, the temperature rises to 100 degrees Fahrenheit or more. Winter temperatures can fall to 0 degrees. The air here is some of the cleanest in the U.S.
All About the Grand Canyon in Winter: Temperatures can fall to zero degrees and the Grand Canyon can get frosty and beautifully wintry looking! Pour some water over sand and notice what happens. The water most likely will run off in one stream, washing away some of the sand and creating a trench. Keep adding water and the trench gets deeper. This is how many valleys are made. A very deep valley is known as a canyon. The Grand Canyon in Arizona is one of the largest canyons in the world. A video of the Grand Canyon Walk. Question: How many people visit the Grand Canyon every year? Answer: Around 5 million people visit annually. Question: How old is the Grand Canyon? Answer: Scientists aren’t exactly sure, but they believe the Colorado River started making the canyon about 17 million years ago. Question: What is the weather like in the Grand Canyon? 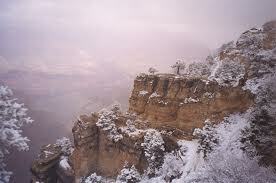 Answer: The South Rim is hot and dry most of the year, while the North Rim can get cold in the winter. The area is very dry. Hikers must bring their own water. Enjoyed the Easy Earth Science for Kids Website all about the Grand Canyon info? Take the FREE & fun all about the Grand Canyon quiz and download FREE all about the Grand Canyon worksheet for kids. For lengthy info click here. Declan, Tobin. " Fun Grand Canyon Facts for Kids ." Easy Science for Kids, Apr 2019. Web. 18 Apr 2019. < https://easyscienceforkids.com/all-about-the-grand-canyon/ >.